"Second base" redirects here. 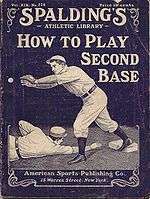 For other uses, see Second base (disambiguation). 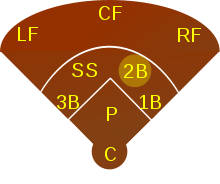 In baseball and softball, second baseman is a fielding position in the infield, between third and first base. The second baseman often possesses quick hands and feet, needs the ability to get rid of the ball quickly, and must be able to make the pivot on a double play. In addition, second basemen are usually right-handed; only four left-handed throwing players have ever played second base since 1950. In the numbering system used to record defensive plays, the second baseman is assigned the number 4. ↑ "From 1950 to 2013, Throws LH, Played: 2B". Baseball-Reference. Retrieved 2010-06-03. ↑ "Stats for Hall of Fame Second Basemen : A Research List by Baseball Almanac". Baseball-almanac.com. Retrieved 2015-07-26.